In 240 BC Eratosthenes estimated the circumference of the Earth to within 100 miles. Ancient Greeks knew Earth was spherical. How did Eratosthenes accurately estimate its circumference? The answer lies in a tale of two cities: Syene and Alexandria. Syene was the ancient name of the city known today as Aswan. Eratosthenes heard that the sun could be observed straight overhead from the bottom of a well in Syene at noon during the summer solstice. No shadows would have been cast on the walls of the well. No shadows would have been cast by the style of an above-ground sundial. 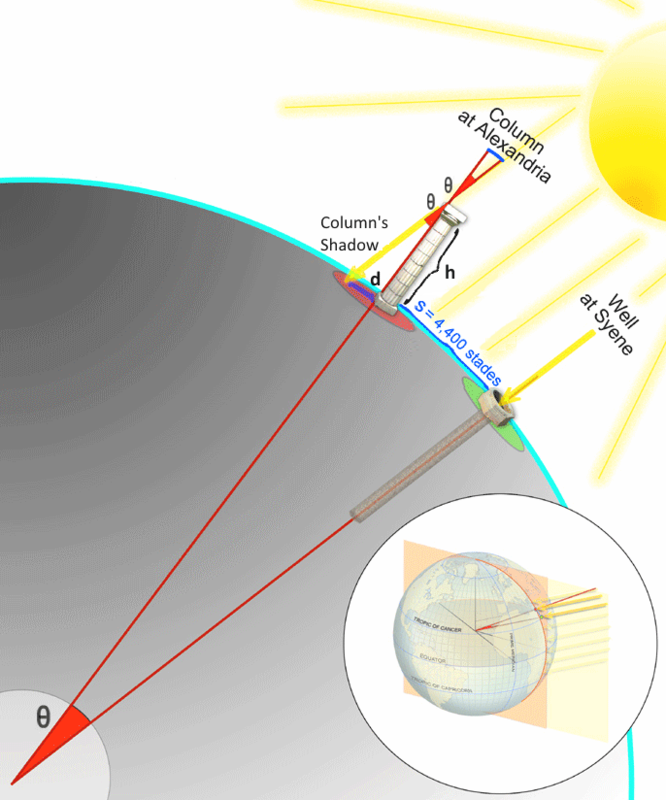 At noon in Alexandria during a summer solstice, Eratosthenes observed a shadow cast by a column. Using the height of the column (h) and the distance (d) of the edge of shadow from the column, Eratosthenes used the trigonometric functions tangent and arctangent to determine the shadow angle θ. Since tan(θ) = d / h, Eratosthenes used the arc-tangent to find the angle. Eratosthenes found the angle θ of the shadow cast by the column to be 7.2°. Syene to Alexandria was an established trade route of camel-driven caravans. Eratosthenes knew the distance between Syene and Alexandria was about 4,400 stades. A stade is an ancient Greek unit of measurement equivalent to the distance of footraces in the ancient Olympic Games in Olympia. The shadow angle 7.2° is to 360° of the Earth as the 4,400 stades is to the circumferential distance C of the Earth. Remarkably Eratosthene's estimate overshot the circumference of the Earth by a mere 99 miles. Eratosthenes is Known as the Father of Geography, Matt Rosenberg, About Education. June 19, 240 B.C. : The Earth Is Round, and It's This Big, Randy Alfred, Wired Archive, 19 June 2008. The History of Geodesy, NOAA.